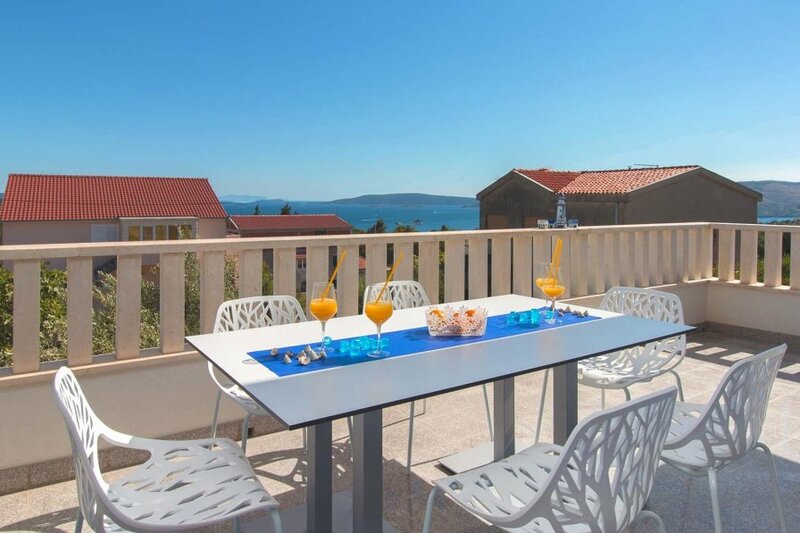 Apartment Gran Vista is a luxuriously furnished contemporary apartment located in Seget Donji, just 3 km away from the UNESCO protected center of town Trogir, 8 km away from Split airport and 500 m away from the sea and the nearest beach. Apartment Gran Vista is located in a modern apartment building, completely renovated in 2017, which consists of 7 apartments covering the first, second and third floor of the building. Each apartment has a magnificent view spreading over the sea and the archipelago of nearby islands and islets. Luxurious apartment Gran Vista is situated on the first floor of the building, spreading on 120 m2 of living area and can accommodate up to 8 persons. The apartment consists of 4 double bedrooms with large beds, 2 bathrooms (1 with shower and 1 with a bathtub), modernly furnished living room and well equipped kitchen. Each bedroom is equipped with SAT-TV, while 3 bedrooms have access to a spacious seaview balcony equipped with outdoor furniture. Apartment Gran Vista is air conditioned and equipped with Wi-fi, SAT TV, common outdoor barbecue, iron and ironing board, stove, oven, hood, refrigerator, freezer, electric kettle, coffee maker, washing machine and hair dryer. Baby cot, high chair, safe and microwave are available on request. The property offers free parking. Enjoy your stay in luxurious apartment Gran Vista and spend an unforgettable holiday in Trogir area!